Go on an Advent journey with beloved teacher and storyteller James W. Moore, exploring the spirit of Christmas. As you light the candles of your Advent wreath, reflect on the unbreakable gifts that God has given us: hope, love, joy, and peace. And remember God's greatest gift, who comes to us as a baby and leads us through all the days of our lives. This revised edition of the popular book includes stories, Scriptures, and thoughts to warm your heart throughout the season, as well as devotions by Jacob Armstrong and a new fifth chapter for Christmas Eve/Christmas Day. Also available are resources for a five-session study, including a Leader Guide, DVD, and resources for youth and children. 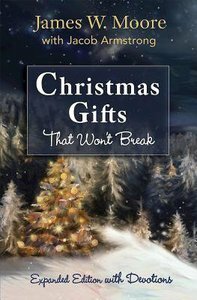 About "Christmas Gifts That Won't Break: Expanded Edition With Devotions"
He is senior pastor of St. Luke's in Houston, Texas. He is the author of Yes, Lord, I Have Sinned, But I Have Several Excellent Excuses and Attitude Is Your Paintbrush. Jacob Armstrong is the founding pastor of Providence Church, a five-year-old United Methodist church plant in Mt. Juliet, Tennessee, reaching 1,000 people each week. Providence s vision is to see those who are disconnected from God and the church to find hope, healing, and wholeness in Jesus Christ. Jacob is passionate about what he calls "Worship Without Walls," taking God's love beyond the walls of a building to places of need in the community and world.